People always come across that kind of things: forget to back up iPhone WhatsApp message in a timely manner, and then again accidentally deleted WhatsApp on their iPhone. So, how can they backup WhatsApp messages on iPhone? Is there any effective way to do that? Don’t worry! Today, we’re offering top 5 Free methods to Backup WhatsApp Messages on iPhone (iPhone 7/plus, iPhone SE, iPhone 6s/6 plus, iPhone 5s/5c/5, iPhone 4s/4). See also: How to Recover WhatsApp Messages from iPhone 7/plus, 6s/6 plus, SE/5s/5c/5/4s/4/3gp? To ensure that your WhatsApp messages have been backed up to the very current moment, you must manually back up them, here’s the process. 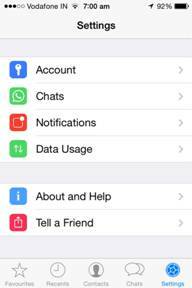 Launch WhatsApp on your iPhone and then go to Chats > Chat Backup > Back Up Now. 1. Backup files are only valid for 7 days after last saved. Make sure you import your chat history before it expires! 2. A daily back up isn’t of that much help since one would opt to sell the phone or it may be unfortunately stolen. 3. Automatic data backup takes place after every 24 hrs thus not much effective than manual back up which is done at whenever one wishes. Step 2. Go to Settings and hit the option Chat. Step 3. Now, on the next screen, select the option of Chat Backup. Step 4. Finally, tap on Back Up Now. 1. Tedious and time consuming as this is a long procedure that takes ones time. 2. The backup process will take some time especially depending on one’s internet connection speed. 3. Videos cannot be backed up using this method. 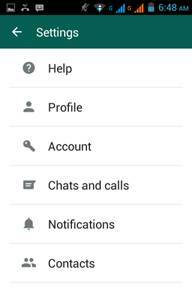 You can backup WhatsApp messages via Email by backing up your chat history on phone, and then transferring your selected WhatsApp messages to the appointed email inbox. 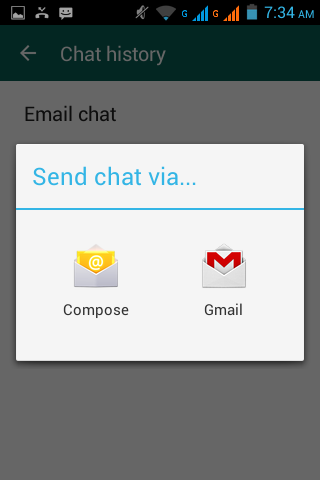 Chat history will be attached as “WhatsApp Chat: txt” file to this email. Step 1. 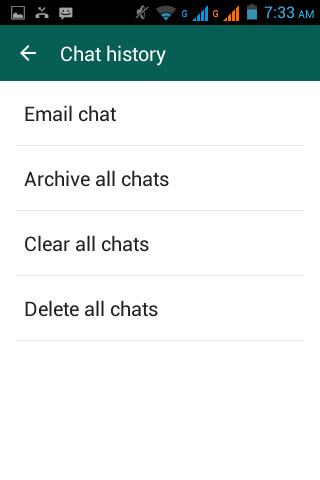 Launch WhatsApp, select “Settings” option, choose the “Chats” and calls option, and then select the “Chat History” option. Step 2. Select the “Email Chat” option and a message will pop up seeking whether to proceed by selecting; “WITHOUT MEDIA” or “ATTACH MEDIA”. Step 3. Now, select how you want to mail it (the data is backed up in “txt” file format). 1. There is a limitation of sending only 10,000 messages at one time. 2. 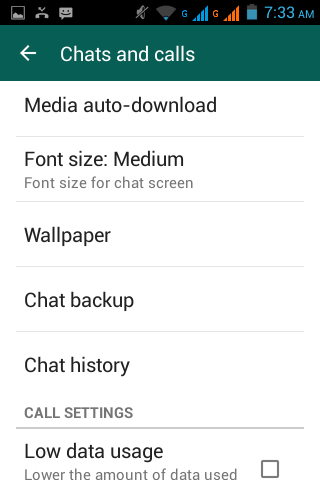 It is not possible to restore your chat history from this exported .txt file. 3. Backup files are phone number sensitive; they will only work with the same phone number. Step 2. Go to Options > Settings. Step 3. 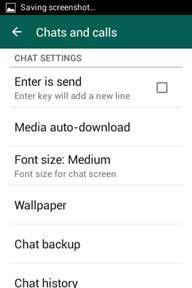 Next, tap the option of Chats and calls. Step 4. 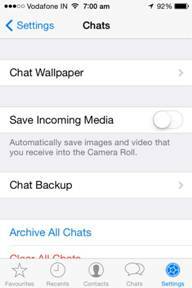 Select the option of Chat backup. Step 5. Click on Google Drive Settings to setup your account if not done already and then tap Back Up. 1. Uploading and downloading speed. When millions of user are uploading and downloading together, the speed may slow down. 2. If not careful, any documents kept in Google Drive could be public. To prevent this, make sure your settings have it default to private (only you can see it), and you can configure each file you have stored to various tiers depending who you want/don’t want to see. 3. As we use internet based services we will tend to use the internet to access data. If this is so, data stored on the Google Drive will be in accessible which is very disappointing. Now that you have seen the stock options of creating free backups for WhatsApp on iPhone, it is time we take a look at an alternative that is much more easy to use and has greater versatility when it comes to being a well rounded Whatsapp backup application. For creating WhatsApp messages backup, there are quite a few software available in the market, however, nothing comes closer to this wonder called the Dr.Fone for iOS. It is the world’s best iPhone WhatsApp Messages Backuo and Recovery software, compatible with the latest iOS devices, including iPhone 7/plus, iPhone 6s/6 plus, iPhone 5s/5c/5/4s, iPad Pro, iPad Air, iPad mini with Retina display, iPad mini, iPad with Retina display, the new iPad, iPad 2, iPod touch 5, iPhone 4, iPhone 3GS, iPad 1, iPod touch 4. 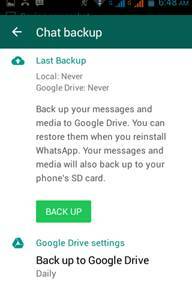 You can selectively backup & restore WhatsApp messages. In additional, the top iPhone Data Recovery does a lot more than just backup lost Whatsapp messages on your iPhone/iPad/iPod. 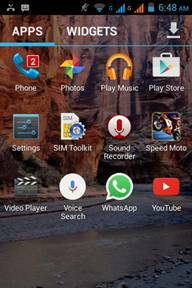 It can also recover all kinds of data such as, messages, contacts, notes, whatsapp, videos, and photos etc. 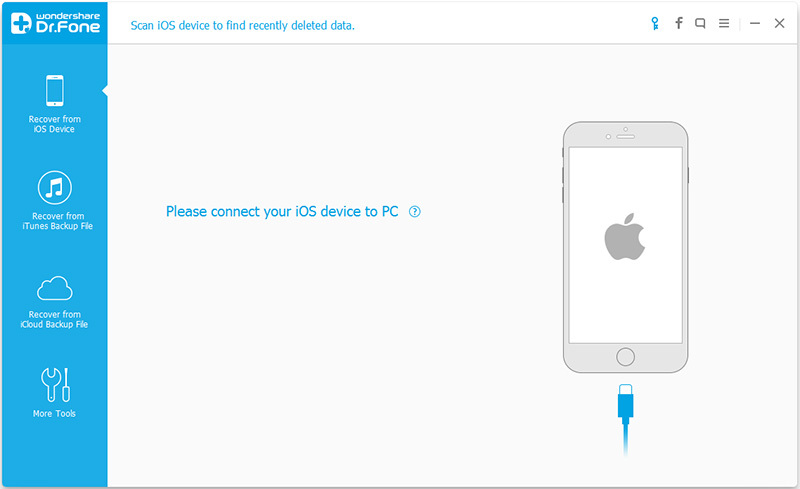 Also recovers from iCloud or iTunes backup. Allows you to select the files you would like to recover. Comes with an inbuilt feature of ‘Repair Operating System’. 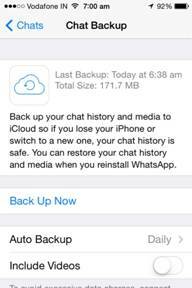 Now, follow the easy steps as given below to backup WhatsApp on iPhone. After downloading, installing the application on your computer. Step 1. Once installed successfully, launch the application by clicking on the icon. Also, connect your iPhone to your computer using the USB cable. 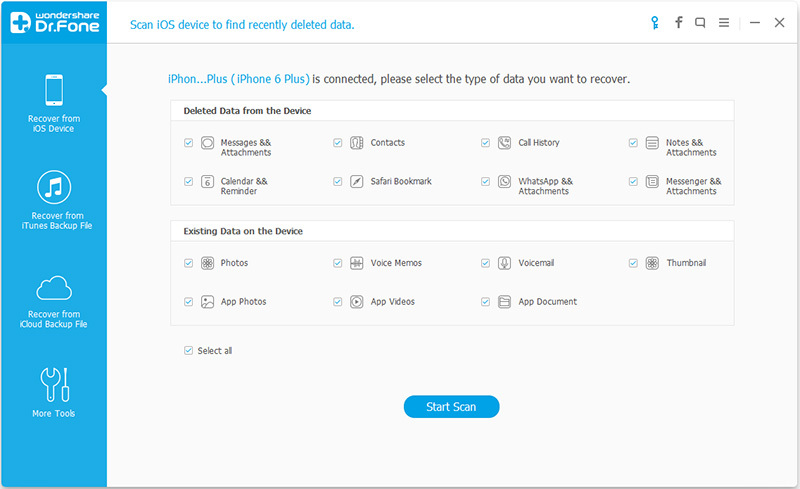 And select the recovery mode “Recover from iOS Device” on the app’s interface. 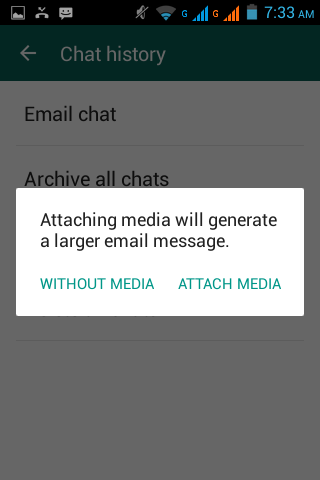 Make sure that the option “WhatsApp & Attachments” is checked or selected and then hit ‘Start Scan’. Step 3. 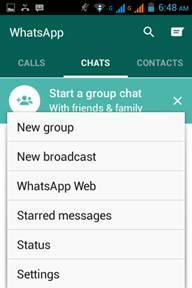 The next screen should show you the scan progress, with the number of WhatsApp items found. Step 4. Once the scan is finished, all the data found would be listed in different categories, you can select them all or choose individually and then hit the button “Recover to Computer” for creating the backup of your WhatsApp messages. Now, you can simply sit back and relax, as the application will take care of everything now, on its own. 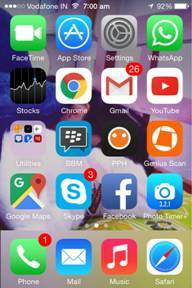 That’s it, you can easily achieve backing up your WhatsApp messages from iPhone through the various free or paid ways. Take a action! If you have different workarounds, please leave your comment, thanks. ← How to Recover WhatsApp Messages from iPhone 7/plus, SE, iPhone 6s/6 plus, iPhone 5s/5c/5/4s/4/3gp included)?